Hanoi (VNA) – Patriotic emulation drives have developed strongly in all fields in society under the theme “Solidarity, creativity in emulation for national construction and defence”, contributing greatly to national growth in 2018, a review conference heard on January 9. At the event, the Central Council for Emulation and Rewards reported that the campaign “All nation join hands to build new-style rural areas” had received enthusiastic response from people of all strata. At present, 3,787 communes and 61 district-level administrative units have fulfilled all criteria of new-style rural areas. Meanwhile, the drive “Vietnamese enterprises - integration and development” was a factor in the establishment of 121,248 new enterprises last year. The movement “All nation joins hand for the poor – leaving no one behind” has won the support and consensus of society. The household poverty rate dropped from 8.23 percent in 2016 to 5.35 percent at the end of 2018, or by an average 1.5 percent a year. The rate in poor districts fell at a higher rate of over 5 percent annually. All-level administrations and agencies have paid attention to rewarding work with a view to timely encouraging good examples and good deeds. During the year, the Prime Minister and the President honoured 55,463 units and individuals. Among individuals rewarded for outstanding performance in all socio-economic fields in 2018, more than 21 percent are workers, farmers and labourers. 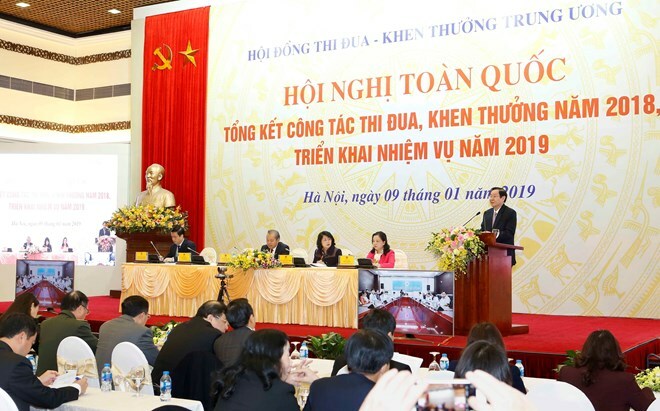 Permanent Deputy Prime Minister Truong Hoa Binh applauded the achievements of the emulation and reward work in 2018, and took the occasion to point out shortcomings and existing problems, including the limited communication work to spread the good examples. The procedures to approve rewards still took too much time, thus reducing the timeliness and meaning of the awards. In some cases, the subjects of rewards were not really outstanding examples, resulting in limited effects on others. The Deputy PM asked the Ministry of Home Affairs to study reforms to the emulation and reward work to suit the situation in the country’s current development stage, stressing that rewards must be presented timely to the right person for the right reason and in an objective and transparent manner so as to ensure the educational and encouragement effects of the work. Vice President Dang Thi Ngoc Thinh, who is First Vice President of the Central Council for Emulation and Rewards, said the emulation work in 2019 should focus on the three drives in building new-style rural areas, developing enterprises and reducing poverty. Another task is to collect opinions on the draft revised law on emulation and reward before submitting it to the National Assembly in October.